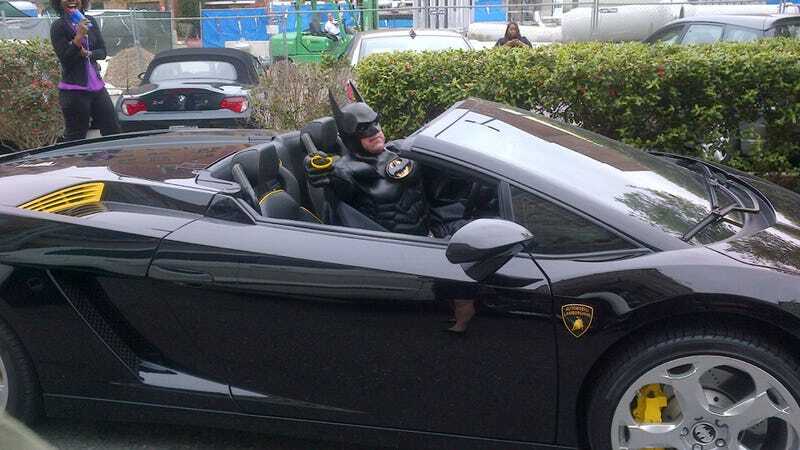 Since posting the photo of Batman getting pulled over in a Lamborghini we've received lots of tips about who this guy is. This recent photo comes from last week at Georgetown University, where we assume 'Lamborghini Batman' was helping sick kids. What a hero. "Lamborghini Batman" first came to our attention when the Montgomery County Police Department pulled over the caped crusader in full regalia but without a license plate on his black Lamborghini Gallardo. It turns out, the guy was coming back form a children's hospital where he was showing off the car and being a much just being a generally sunnier Dark Knight than the one we're used to. Now we've got this photo from last week of Gotham's finest hanging out at Georgetown. Can we make "charitable superhero'" the next Lamborghini-owner stereotype please?